It has been an amazing year introducing Danielle LaPorte’s “The Desire Map” to the entire world. The retreats have been amazing, and I continue to get requests to have more, and I can’t even explain how grateful I am, hats off to all of you for letting me be your guide in this work. It brings me to tears each day to know that I am living my life’s purpose, and that I am helping people like you do the same. I am in my bliss, and each day I am evolving into who I am meant to be. It truly never ends, but know that when you’re in alignment what you want ultimately manifests :-). And how about this? What if we were open to thinking that the best will come out of something rather than the worst? It’s kind of like if you view a glass half empty vs. half full. Which do you find yourself connecting more with? Just imagine if your life everyday had you feeling joyful? confident? loved? empowered? blissful? you fill in the blank ______________, Amazing right? But what stops you from getting there? YOU. It’s much easier to push YOU to the side and give your time and energy to other people and things. We all make excuses, I have too. Not enough time in the day, not enough money, not ready yet, scared as hell, not for me…..can you relate to any of these? You ever think that we do that to avoid putting ourselves first? We get so used to living with the excuses and “ugh” feeling that we don’t know how to feel or do better. And then we settle, we think this is how it is supposed to be, and we don’t do anything about it. 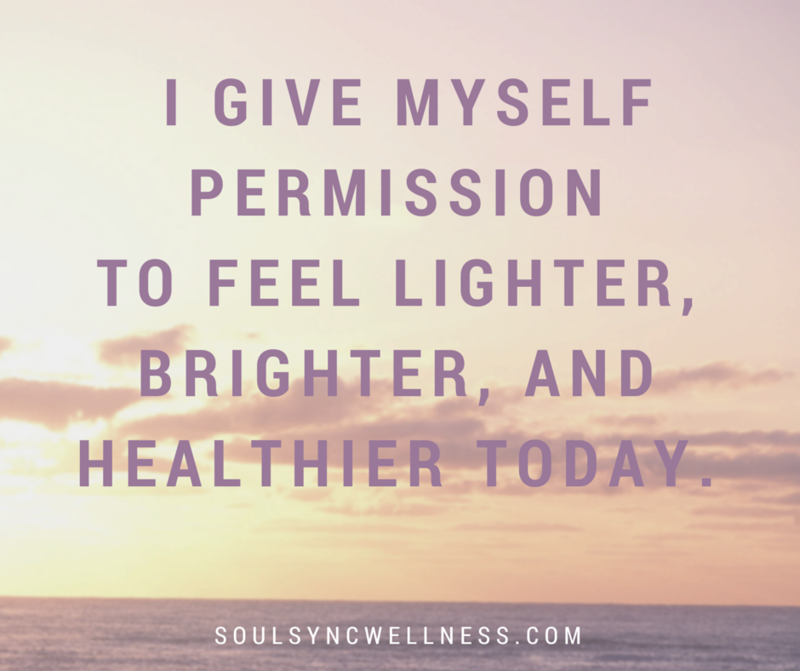 Then it leads to complaining, anxiety, and health issues all because we decided to give ourselves permission to stay right where we are instead of giving ourselves permission to go where we want to go…. I’m here to tell you that it’s possible. 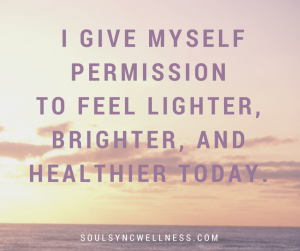 It’s possible to go from living in a place of feeling stuck, tight, pit in stomach, unhappy, overweight, broke…I could go on…..to a body feeling free, alive, open, light, and a life we love and deserve. It’s not selfish. It’s what you need to be your best self in all aspects of your life. I recently gave a talk to a group of 60 women, and we talked about how putting ourselves first is such a guilty feeling because it’s expected that as women we will do all for everyone. My reply, “who told us that we are awful people for putting ourselves first?” Answer from the group, “we did because that’s the expectations that were set upon us growing up…” What once was, isn’t today, here, now, in this moment. We must evolve. Just think what would it feel like if you felt like you were the best mom, career woman, entrepreneur, friend, colleague, family member, partner etc…the list goes on and on and for each of you it is entirely different. We all have dreams, we all have desires. That’s the beauty of this Desire Map work, you have gifts, you embody greatness, you were brought into this world for a reason, and just think if you felt like you knew what that was, and were able to live and feel it everyday with freedom and ease? What if you gave yourself that permission to take one day for you to refocus, re-sync, decompress, relax, rejuvenate, and become reconnected with your soul’s purpose? Let go of the weight off of your shoulders? This is what we do during our time together (among many other things including laugh, eat nutritious food, participate in yoga and meditation, and more), and you get to join a community afterwards of others who live each day feeling their core desired feelings. Everyday, I desire to feel balanced, inspirational, intuitive, abundance, and creative. These feelings have guided me over the past few years to today. I can’t wait to experience this with you, and hear how you want to feel everyday. Are you ready to give yourself permission to put yourself first? Even for one day? Join me……..November 21, 2015……..9-6 p.m. with a 90 minute intro zoom session the week leading up to it. Limited space available……and take November to be grateful for yourself :-).